You’ve most likely seen them at your local parks practicing as an individual or a small group moving slowly in a fluid routine. Their arms float over their heads in circular motions. They gaze softly at a point in the distance, concentrating and breathing deeply with each move. They look calm, focused, and relaxed. They are practicing the ancient martial art of tai chi. Tai chi is a series of repetitive movements in a very slow and deliberate manner. This low-impact exercise is an ideal workout for elderly individuals with limited mobility. At Aegis Living, we have modified our tai chi classes to be practiced from a chair so our residents can get the benefits of the exercise without having to stand for an extended period of time. Tai chi is based on relaxation and coordination which can have a calming effect on our residents who are agitated or frustrated. And with continued practice, seniors can strengthen their muscles and increase their flexibility through this gentle aerobic exercise. Originating from China as far back as 2,500 years ago, tai chi is practiced now around the world. 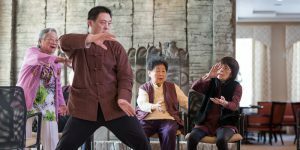 As an ancient Chinese martial art, tai chi has descended from qigong, a discipline that focuses on the mind, breath, and motion to center oneself. Often described as meditation in motion, tai chi is believed to clear your mind and reduce stress through concentration on each movement. How can it benefit the elderly? At Aegis Living, we have seen many significant benefits for our residents who practice tai chi. These benefits have been backed by research in the field. But the benefits of tai chi can be felt not only physically, but emotionally as well. Many of our residents come to us feeling unsteady on their feet and off balance. They have a real fear of falling and hurting themselves or perhaps they have already experienced a fall. Ironically, the most significant predictor of a fall is the fear of falling. This intense fear can be very stressful and may deter residents from exercising and participating in activities. Thus, they will lose muscle strength and coordination. Tai chi can be practiced safely and effectively from a chair, taking away that fear of falling. Tai chi will make them stronger and feel more stable, adding to their personal wellbeing and quality of life. Can dementia patients benefit from tai chi? Any exercise or workout that gets someone off the couch and moving will benefit the person both physically and emotionally. Movements can be easily adapted by a skilled instructor to meet their physical limitations. Since this can be practiced safely from a chair, it is a great exercise to encourage your parent to try. And some promising studies have shown that exercise can help delay the progression of dementia. If you are concerned about getting your parent into an exercise program, discuss your concerns with their physician. Can a stressed caregiver benefit from tai chi? Although tai chi is great for seniors, it is also useful for any age, particularly for a stressed-out caregiver. We know busy caregivers who are juggling work, family, and caring for a parent can use a much-needed break. You will find the entire practice to be very meditative. It can quiet your mind, allow you to focus on one thing, and bring a sense of peace. It is also a great activity that you can share with your parent and practice together. The best part of tai chi is there is no specialized equipment and can be done anywhere. The movements can be adapted by a skilled instructor to fit every age group and fitness level. Classes can be done outside on a sunny day or from the comfort of a chair indoors. It is also an excellent way for your parent to socialize with their peers. Search for a senior tai chi class online, stop by Aegis Gardens in Newcastle, WA to try one of our classes, or contact a local senior center to try a beginner’s course near you. At Aegis Living, we take a holistic approach to caring for our residents’ mind, body, and spirit. We find that tai chi can be a great way to meet their physical needs while stimulating their mind and improving their overall sense of wellbeing. If our parent can no longer live on their own, contact an Aegis Living community near you and schedule a tour. Our staff welcomes the opportunity to meet your family, give you a tour of our community, and show you the calendar of activities that we offer daily.